In November I went up to Portland, Oregon, to teach one of the 10×10 Urban Sketchers workshops, on Interior Perspective. 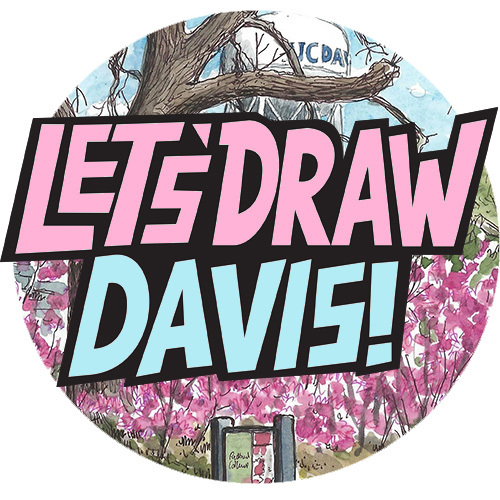 I was invited by my friend Rita Sabler (the excellent Portland reportage sketcher), and it was as always an enjoyable visit to one of my favourite cities. I only ever seem to go these days in dark November, but this time it was not rainy at all. It was very colourful in fact, with the autumn leaves out in full force. I tried to capture as much of that as possible in my out-and-about sketches. Above, Portland’s Saturday market, with the Skidmore Fountain in the foreground. 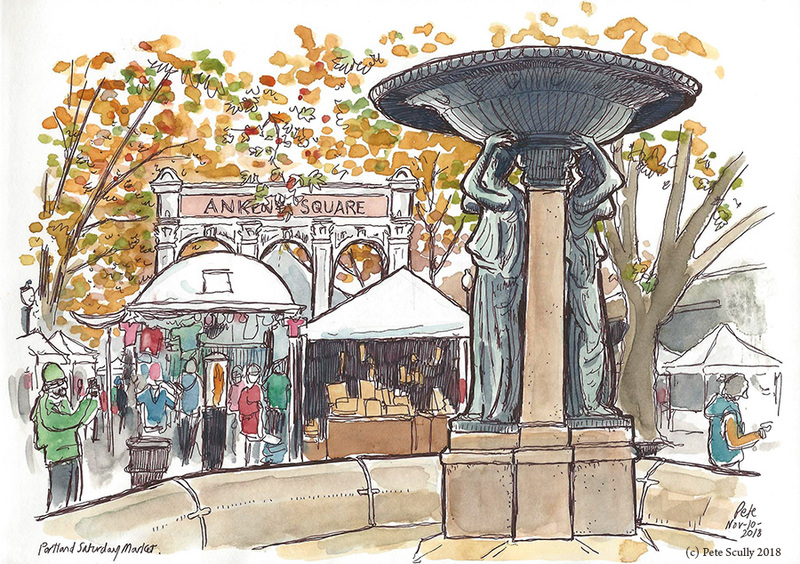 I sketched this fountain in 2010 at the first USk Symposium, on a Saturday morning perspective sketching class with Frank Ching. That was the moment I always look back to when I really gave up my inhibitions about drawing in public; rather than find a place to hide and be invisible, better to sketch openly and not worry about being ‘in the way’, become part of the place. On this day, I was able to observe the market as some stalls were still setting up, and as people passed by I got a real feel for the character of this quarter of Portland. 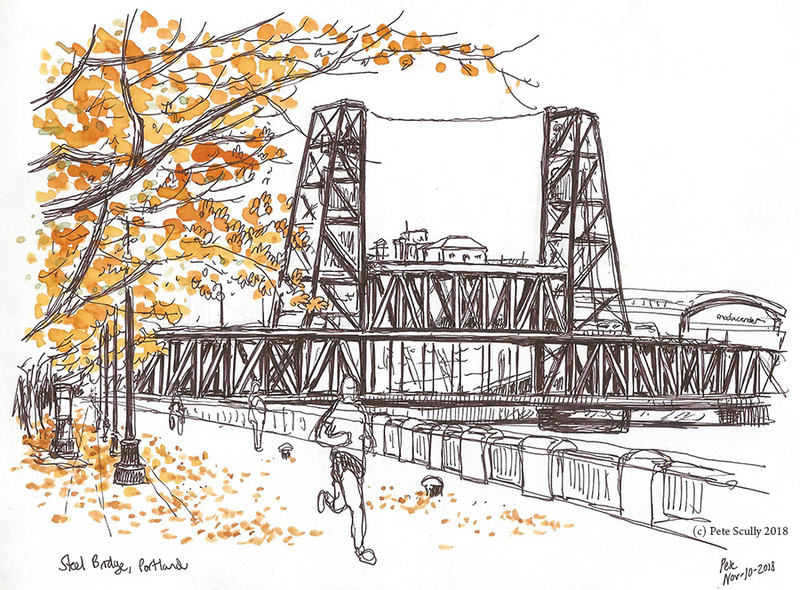 I like the Steel Bridge, another one I drew on that first Portland symposium, that time at a workshop with Lapin, I sat between him and Gerard Michel discussing different approaches. I’ve always wanted to return to this riverbank in the Spring when the blossoms are all pink, but coming back in Fall with golden leaves floating down is almost as nice. I did get a bit cold though, and so streetcarred it back to the hotel for a rest before my workshop. This one was sketched at the food carts area at Alder Street, after I had spent a good long afternoon wandering about Powell’s. Powell’s is such a great big bookstore, I could spend forever in there. They had my books, too, which is always exciting to see. I have a tradition now of going to Powell’s and then wandering up here for a big hot dish of Thai food, and I was not disappointed. I sketched across the street, the sunlight starting to fade, the urban greys brightened up by the reddish orange of the trees. 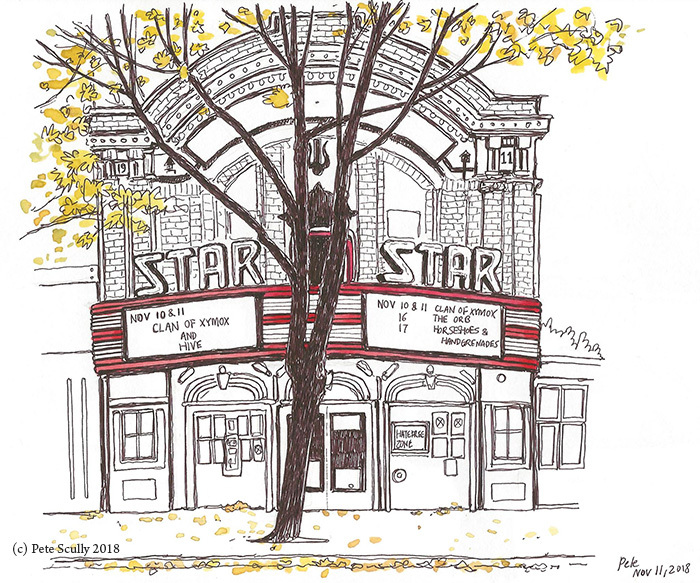 Not too far away, a bit earlier in the day, the Star Theater, with yellowy leaves scattered about. 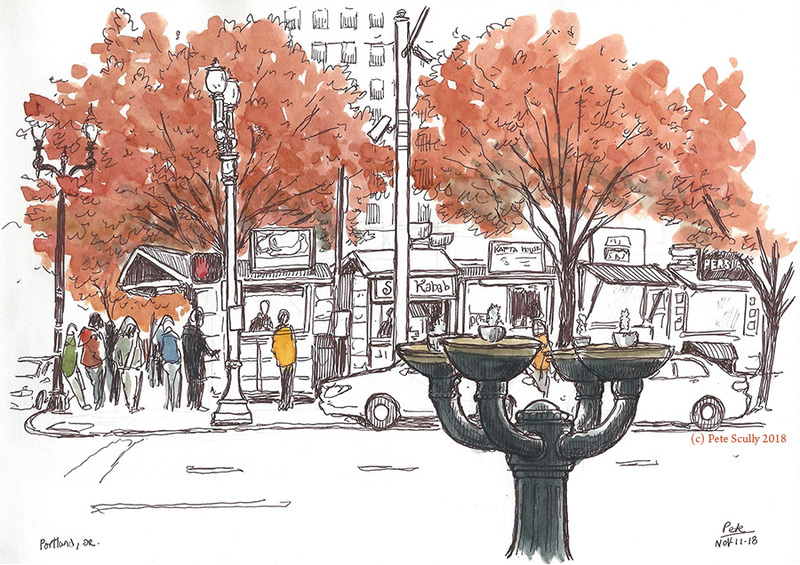 A group of homeless people sat nearby talking and laughing, streetcars rattled past, a slight breeze blew leaves and thoughts past as I sketched. My legs were hurting; I had had a night out before, and a good lie-in, but as each year passes I always forget I need a bit more rest. I spent the rest of the afternoon in Powell’s. 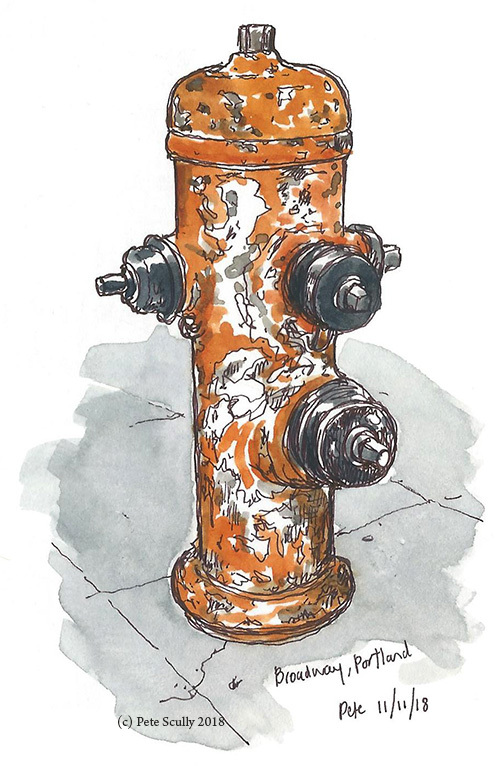 And below, of course, an orange Portland fire hydrant, weather-worn and pock-marked.